Editor’s Note: Readers coming to Points for the first time may be interested in some of our other posts treating psychedelic experience. They include (but are not limited to) Religious Studies Professor Gary Laderman’s meditations on the place of LSD in the late 20th-century US; a two-part series by Comparative Literature scholar Tace Hedrick, looking at the influence of Gordon Wasson on US psychedelic culture and of psychedelics on feminist theorist Gloria Anzaldua; and some by Brian Herrera of Performance Studies. Search under the Tag “psychedelics” for a complete inventory. LSD is one of the most mythical drugs in history. As with regard to many other drugs, our culture is almost satiated with perceptions, sentiments and opinions about the substance. Most of them have a history that can be traced back to the Sixties, that strange and almost mythical period when the most fundamental certainties of western society seemed undermined – at least to those high on acid. But more than myths and vague associations are hardly discernible when looking at present-day perceptions and sentiments around LSD in popular culture. Sixties and hippies are one set of associations often encountered; adolescent users becoming psychotic and jumping out of windows and of balconies or eating the bark of trees another. Or, on a more positive side, people envision mystical enlightenment and heightened sensual perceptions. As a mythical drug LSD can be everything to everyone, a focal point of contestations about social, political and metaphysical realities. 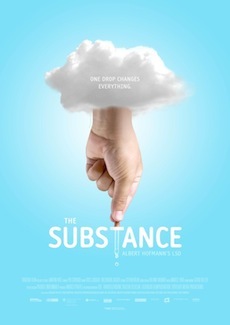 The recent Swiss documentary The Substance: Albert Hofmann’s LSD, directed by Martin Witz and produced by Andreas Pfaaffi, tries to reconstruct the tumultuous history of LSD from its discovery by the Swiss chemist Albert Hofmann in the Sandoz laboratory in Basel in 1943 until the end of the Sixties. In must be said at the outset that the movie basically follows the story as outlined for instance in Jay Stevens’ Storming Heaven: LSD and the American Dream (1987), though adding some material from psychedelic therapy sessions in recent years and interviews with participants. [Editor’s note: an article on some of these experimental protocols appears in last Sunday’s New York Times.] To those viewers who are familiar with the story the documentary offers nothing new. What is most interesting is the documentary footage from movies made in the 1940s, 1950s and 1960s: of a young Hofmann with family, of experiments by American civil and military psychiatrists, of therapy sessions in Communist Prague, of LSD guru Timothy Leary and his group, of underground acid production and a psychedelicized Haight-Ashbury. But the documentary is in the first place interesting to a more general public with little knowledge of the subject. With the help of the footage and interviews with participants, including Hofmann shortly before his death, history, dangers and possibilities of LSD are shown to some extent to the general public. The message of the documentary seems to be that LSD has been and is a dangerous drug, but can have significant therapeutic possibilities in psychotherapy under expert guidance. Some things went wrong in the Sixties, but that shouldn’t close our eyes to the positive side. Whatever one thinks of this message, there are other interesting aspects of the history of LSD. Paul McCartney, himself in the 1960s a convinced user of LSD as a means of becoming a better and happier human being, once said that he thought it strange that the Sixties had already happened. In his experience the decade was so strange and avant-garde that it was still in the future. There is no sense in idealizing the Sixties but the footage in The Substance gives us some inkling of the experiences underlying the statement of the Beatle. Let’s do an exercise in virtual history and imagine an alternative historical development. In an alternative universe the dream has become true that is expressed in the movie by Harvard psychologist turned into drug apostle turned into criminal Timothy Leary. Somewhere, he says, and the footage has to date from between 1962 and 1965: we (he and his associates) expect that in the next 5 to 10 years twenty to thirty million Americans will use LSD on a regular basis, for their spiritual development and psychological growth. Instead of a materialist, conformist and warlike America, as the USA was in the perception of Leary and thousands of other Americans at the time, there would develop a hippy paradise in which people would surround themselves with sacred objects, be in harmony with nature and would be free of sexual jealousy. There are many reasons why this hippy paradise did not come to exist in our universe. Paradoxically, one of the most important is the same reason why LSD became so popular in the first place: the ‘democratization’ of the substance. Because the most extraordinary aspect of the history of LSD is not the subjective effects of the drug, such as the mystical experiences, the changed perceptions of physical reality, or the feeling that one has become God. Many other substances give similar effects, for instance the magic mushrooms used in the documentary by the Mazatek healer in Mexico Maria Sabina, or the peyote taken by Indians on the American reservations since the end of the 19th century. The use of a psychedelic substance to elicit mystical experiences was already in the 19th century available through post order if one wrote to occult teachers like Paschal Beverly Randolph. Mescaline had been synthesized in a German laboratory in 1919 and had been used since then by psychiatrists, psychiatric patients, artists, philosophers and others, a full quarter of a century before the discovery of LSD. But all these uses were limited to small and closed groups. With LSD something different happened, and Leary was to an important extent responsible (to the horror of more traditional intellectuals as Hofmann and Aldous Huxley). He and others ‘democratized’ LSD. The ‘sacrament’, as they perceived it, should not be in the hands of a cultural and social elite, but available to everyone, to the masses. And these masses were found in the baby boom generation that came to adolescence in the 1960s, and reacted against restrictions and conformities associated with their parents. The paradox here is that though LSD is a substance that can take you out of your ordinary life into something totally Other, in the Sixties at the same time the substance itself was taken into ordinary life, became a focus point of social struggles and ultimately went out of control. And as with most other drugs, the question became: who controls the use? 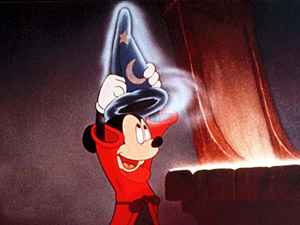 We can view The Substance as a historical documentary, but we can also view the movie in a different way: as a remake of the famous scenes of the Sorcerer’s Apprentice in Walt Disney’s Fantasia, an animated movie from 1940 that has been related to Disney’s own mescaline experiences. In the Sorcerer’s Apprentice, Mickey Mouse uses the sorcerer’s hat to do magic, going on a trip that turns out badly and ends up in a mess that has to be cleaned. The Substance is filled with sorcerer’s apprentices who released the magical potion LSD into society, without really knowing what the consequences would be. Hofmann, Leary, the banker Gordon Wasson who made news about the magic mushrooms public so creating a stream of drug tourism to Mexico, the writer Ken Kesey touring the United States with LSD available for all– as Mickey Mouses they all worked with powers that they could not control. Neither could other people: doctors, politicians, police officers, or the military. The result was that the drug literally spilled over into the streets, a sacrament for grabs to all and sundry. With all kinds of unintended consequences. These failed attempts at control might be what makes the history of LSD and the Sixties particularly fascinating: a time when people did not seem to hesitate to plunge into something new, despite all the risks. To a society in which risk control has become one of the major aims, the story of acid shows a mirror of an alternative universe. > ‘democratization’ of the substance. As I and others have discussed elsewhere, particularly on the MAPS list, what happened to make LSD “public” were the remarkable cultural/intellectual developments of the Cold War and, in particular, the decision by some key players that the global situation had become so “ripe” that a general release of “psychedelics” would *literally* change world history. Unfortunately, those who were involved did not want this “plan” to be identified for what it was, so they concocted a series of “stories” for the credulous — including the story that LSD as “accidentally” discovered. It was not. The discovery of LSD was actually quite methodical and deliberate and had even been pre-announced in the novel “St. Peter’s Snow” years before the presumed “original” 1938 synthesis. In fact, as Hofmann et al detail in their book “The Road to Eleusis,” the notion that ergot-derived “initiation” into a higher-more-civilized life had been at the cornerstone of Western culture for a very long time. I find the position of LSD in our popular culture to be extremely frustrating. It is arguably the safest mind altering substance known to humanity, but has been the victim of propaganda, lies and ignorance. I will definitely be keeping an eye open for this movie, but have to admit that I am tired of people who portray LSD as a “Dangerous Drug”, and pay homage to the scarelore of the 1960s. Yes, it has its risks, but it is hardly as if “dose, set and setting” are some sort of newsflash. LSD is non addictive, non-toxic and psychologically safe. Its “dangers” arise because it is powerfully psychoactive, but that is precisely the reason why we consume it in the first place. How do LSD experts rate the account in Roy F Baumeister and Kathleen S. Placidi. “A Social History and Analysis of the LSD Controversy” in Journal of Humanistic Psychology. 23 (1983): 25-58? By the way, the contrast between the relatively large social history literature for LSD and the meager social history studies of methamphetamine makes me wonder whether scholars have lost interest in poor people. Meth wasn’t big at the Harvard Faculty Club, I guess. Actually, “speed” was (and is) *very* popular among the rich and powerful. You will find many accounts of “Dr. Feelgood” and his amphetamine/vitamin/?? (injectable) “cocktails” in the various biographies and stories about the 1960s (and beyond.) After all, most people can’t take LSD everyday and go about their activities. The Andy Warhol scene was filled with these “cocktails” and indeed JFK was also apparently a daily user. Perhaps someone should write a comprehensive “social history” of all this activity. What sets LSD apart from all other drugs in terms of social history is that it was deliberately introduced to “change the world.” That really cannot be said about the other psychedelics or, for that matter, opiates or stimulants or other “recreational” drugs. For instance, the recently published book by Peter Janney, “Mary’s Mosaic: The CIA Conspiracy to Murder John F. Kennedy, Mary Pinchot Meyer, and Their Vision of World Peace,” attempts (albeit not very successfully) to knit together the social histories of the bomb and acid. More needs to be done on this topic.